There was a statement over at Left in the West that I was curious about. Since the public is not allowed to openly comment on the site I will pose my question here. Jay made the comment that "Now's the the time to start talking about cheaper, sustainable sources of energy that are locally owned. The technology is there, why aren't we using it?" My question is, what are these technologies that are cheaper, sustainable and locally owned? Links would be really nice to study them. In the long run, if we want to get away from power technologies that don't add CO2 to the environment, they are not going to be cheaper than the carbon based alternatives. That's why we use the carbon based fuels, they are cheaper than the non-carbon based. I would be interested in these "cheaper, sustainable sources of energy that are locally owned." They might be sustainable and you might be able to do them locally but cheaper, I really doubt it. Information is the key. If these solutions are out there let me know. Don't just make blanket statements that they are widely available and leave it like that. Some of us may have questions. I heard something very interesting the other day. I had a neighbor preg check his replacement heifers and ended up with 22% drys. Well over normal for them just like my 24% dry was well over for me. Now I really wonder why my neighbor, over 10 miles and 3 herds away, would have about the same dry percentage as me? This is really curious. Maybe there is a deeper mystery here. I will have to find out how other people's heifers did in this area. Maybe I don't have as big as problem as I thought. Maybe it's sunspots or aliens or smoke in the air causing the problem. It will be interesting to find out some other people's percentage. The next question is, will this continue through to the cows? Damn, too many questions and not enough answers. I was visiting with a guy the other day and he made the comment that he had heard they were having to sell mother cows in California due to the drought there. He said he couldn't figure out how the droughts were so much worse nowadays and right away people were having to sell cows. I responded by asking a question. Are the droughts so much worse than they used to be or are cattle producers so running to the limits of their grass that any diminution of the grass causes them to not have enough? I remember many years ago people didn't run as many cattle in this area as they do now. They have to run more cattle/acre to pay for the higher prices that everything costs, fuel to vehicles, insurance to clothes. So which is it, are the droughts worse or are cattlemen running more cattle? The guy I was talking to wouldn't commit but it gave him something to think about? I had some thoughts and questions about the recent Brucellosis issue in Montana. I was really wondering if the seven cows that tested positive were vaccinated for brucellosis? This was the case in Wyoming when they originally discovered cattle near the park had Brucellosis. It was in all ready vaccinated cattle. Yesterday evening I had the answer to this question delivered to me so it was a question no more. I've heard a little more about the situation from the proverbial horse's mouth. My source of information informs me that the cattle that tested positive were vaccinated against brucellosis. So this leads to another question, why the hell do we bother to vaccinate if the vaccine isn't very effective? I realize that there are quite a few people in Montana that don't vaccinate but there are a lot of people, including me, who do. Why do we bother if apparently the vaccine has a failure rate of 35%? Something to think about. Another question, why is it necessary to destroy the whole herd of cattle for a few cows testing positive? This doesn't make a lot of sense. When they originally eradicated brucellosis in the state they took blood sample from all the cows and only destroyed those that tested positive or tested suspect twice. Why can't they do that here? Why not bleed all the cows and only destroy those who test positive? Wouldn't this make more sense than randomly destroying all the cows for just being in the wrong place at the wrong time? It sure would to me. The government doesn't look at it that way though. Killing them all is just easier. They are going to destroy this whole herd of cattle and the owner more than likely will get no compensation for it. They vaccinate their cattle for brucellosis and still will have to sacrifice them to the all powerful government because it is easier on them. This should change. The cattle that tested positive for brucellosis had been in the Paradise Valley near Emigrant. According to the information I've heard, the cattle were a lot closer to Yellowstone National Park than Emigrant so it sounds to me like the reservoir of brucellosis infection that is Yellowstone National Park is more than likely to blame for this little outbreak we are now having. Whether this infection comes from the bison or the elk, I don't care. The problem is the reservoir of infection that is allowed to exist in the Greater Yellowstone Area. I don't have an answer on how to clear up the brucellosis problem in the park. Between the elk and the bison in the area, there are too many wild animals spread over too large of area to control. Ignoring the problem of the brucellosis infection in the Park will not make it go away. It just prolongs the problem and costs people like the ranchers who cattle are going to be destroyed a lot of money and heartache. I have been approached by a commercial entity about using some of my photographs on some of there web pages. Does anybody out there know how this works? The individual said my pictures are of value so I need to get the value out of them if he uses them but he is not sure how to structure the deal either. This is a new deal for him too. I know I would prefer some kind of use deal instead of selling them but I don't know how it's done. I thought I would ask the question here in case anybody knows something about it. I have a question that I hope somewhat out there can answer for me. What's the big deal about New Years? This ought to tell you how clueless I am about popular culture because I can't figure out the whole thing about New Year. Today is just another day like yesterday. A day to be savored and enjoyed since there will be no other day like it ever again. A unique and wonderful day that follows a different unique and wonderful day the day before. The only difference is the number in the Year. Not a big deal in my opinion. A large majority of the people go out and party on New Year's Eve in some strange ritual I don't understand. I never have figured out the reason for the party. Are you celebrating the end of a horrible, rotten year and drowning your sorrow in booze, or are you celebrating the change in the number on the Calender in desperate hope that somehow things will be better? These things have never made sense. Drowning your sorrows in booze never accomplishes anything and hoping things will be better without changes in who you are and how you do things is fruitless. Just because the number in the Year changes doesn't mean things are going to be better without changes in yourself, to think anything else makes no sense. Then last, why is this strange ritual in the middle of winter? To me the New Year begins when the calves are hitting the ground, the grass is getting green, and the trees and bushes are budding. The earth is showing signs of new life after the cold, hard winter and a "New Year" is upon us to enjoy and nourish. This is a New Year that makes sense to me. Admittedly, this type of New Year happens at a different time in every place in the world but at least it makes sense to me. This ritual popular culture has us celebrating is bizarre to me and makes no sense. Today is not a New Year, just another day the cows need feed, chores need done, and life needs to continue, just like yesterday. What's the big deal? P.S. So what is a person who flat doesn't care about New Years called, a stick in the mud? Thirty miles outside this down-at-the-heels seaside town, Justin Betombo tends his vanilla plants and cheers the local soccer team as if he had not a care in the world. And in fact, what was once his greatest worry has been almost magically lifted from his shoulders. In the local prosecutor's office, a file filled with accusations that he had sodomized his 9-year-old niece has vanished. Mr. Betombo was arrested in 2003 after the girl, Kenia, said he had savagely assaulted her. The police obtained his confession, which he later recanted, and a doctor's certificate that Kenia had been sexually violated, rendering her incontinent and anorexic. Twice they sent the case file to the prosecutor. There matters ended. Mr. Betombo attended one hearing in the prosecutor's office, but Kenia's parents say they were not told about it. The records are nowhere to be found. And Mr. Betombo walked away a free man. Kenia's parents, distressed by what they saw as a travesty of justice, asked that her name be published, hoping that her case would set an example. It's a hard story to read that's for sure. What's the answer? Wish I had one. Does anybody out there have any answers? I don't see how throwing money at the problem will help. What really struck me was the parts about having to pay the cops to get them to investigate the situation. How can that attitude be changed? The Canadian Food Inspection Agency confirmed on Wednesday a new case of mad cow disease in Alberta. It is Canada's fifth case in 2006 and the eighth since 2003, when the disease was first found in this country, officials said. I continue to find it interesting that Canada has such a problem with BSE and in the US, with a much larger herd, we have only had a couple of native cases. I still think COOL here in the US would help with this situation. Let the consumer decide if they want to limit their beef consumption to one country or just buy meat from wherever. I personally think the typical consumer only cares about the price of beef and not considerations such as where it's from or disease that they will most likely not contract. This will sure get RCALF going again on this BSE/Canada issue again. Let's check it out. Today the Canadian government confirmed bovine spongiform encephalopathy (BSE) in another Alberta beef cow, making this the ninth BSE-positive animal of Canadian origin. “R-CALF has been saying all along that it appears the prevalence of BSE in Canada is a lot higher than anybody anticipated,” said R-CALF USA President and Region V Director Chuck Kiker. “This raises a tremendous amount of concern, especially in light of the fact that it does not appear Canada’s meat and bone meal ban, or feed ban, was effective. “With numerous cases of BSE in older Canadian cows, and the four cases in animals born after Canada’s 1997 feed ban, Canada could continue to discover BSE cases for years to come,” he added. I sure wish R-CALF would put this kind of effort into stopping our government from forcing NAIS down our throats or enforcing the Packers and Stockyards act to prevent the meat packers from screwing the farmers and ranchers. But they feel the BSE/Canada issue trumps all. Awful short sighted if you ask me. They need to open their eyes to other problems. Recent rains aren't enough to snuff out the fire danger in the region. It's definitely no time to be complacent, said Hoyt Richards, southern land office area manager with the Department of Natural Resources and Conservation. Excuse me!!! What did I miss. What rain are we talking about. It's been months since anything resembling moisture fell from the sky. Did I miss a memo or something? Some would say these quotes describe the US. Any thoughts. I have a question to ask that I have never been able to find an answer to. 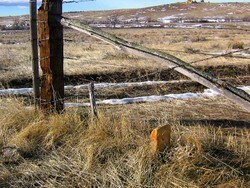 In the foreground of the above picture on the fence line you see a rock sticking up out of the ground. 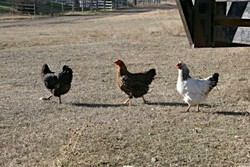 You will find rocks sticking up out of the ground in various places around the ranch and they are cornerstones. Cornerstones mark the corner of sections when they surveyed this country but not all corners have them, just some. The question I have falls with the stone in the picture though. It is a "cornerstone" but it's not in the corner of a section. It is in the middle of the section line. So, is this stone still a "cornerstone" or is there another designation for it since it falls in the middle of the section? Mid-section stone? Doesn't have quite the ring if you ask me. Any ideas out there?